Barnaba Niccolo Maria Luigi Chiaramonti was crowned Pope Pius VII on this day in 1800 in Venice. A papier-mâché version of the papal tiara had to be used as the French Revolutionary army had taken the original with them when they took the previous pope, Pius VI, to France as a prisoner. French troops under Napoleon Bonaparte had invaded Rome in 1796 and seized Pius VI, who was taken to Valence, where he died in 1799. The conclave to elect his successor met on 30 November that year in the Benedictine monastery of San Giorgio in Venice. This was because Pius VI had issued an ordinance in 1798 saying that the city where the largest number of cardinals were to be found at the time of his death was to be the scene of the subsequent election. When he died there were 34 cardinals in Venice and others soon joined them. After the conclave had lasted three months and the cardinals had been unable to agree on a successor, Chiaramonti was suggested as a compromise candidate and was elected. It was the last conclave to be held outside Rome. He was crowned in Venice on March 21 and then left the city by sea to return to Rome. 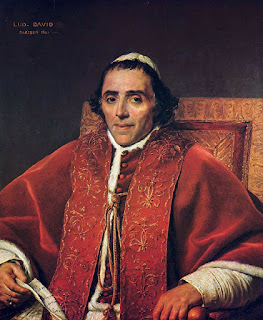 Chiaramonti was born in 1742 in Cesena, then part of the Papal States. He became a Benedictine and later was made Cardinal and Bishop of Imola by Pius VI, who was one of his relatives. 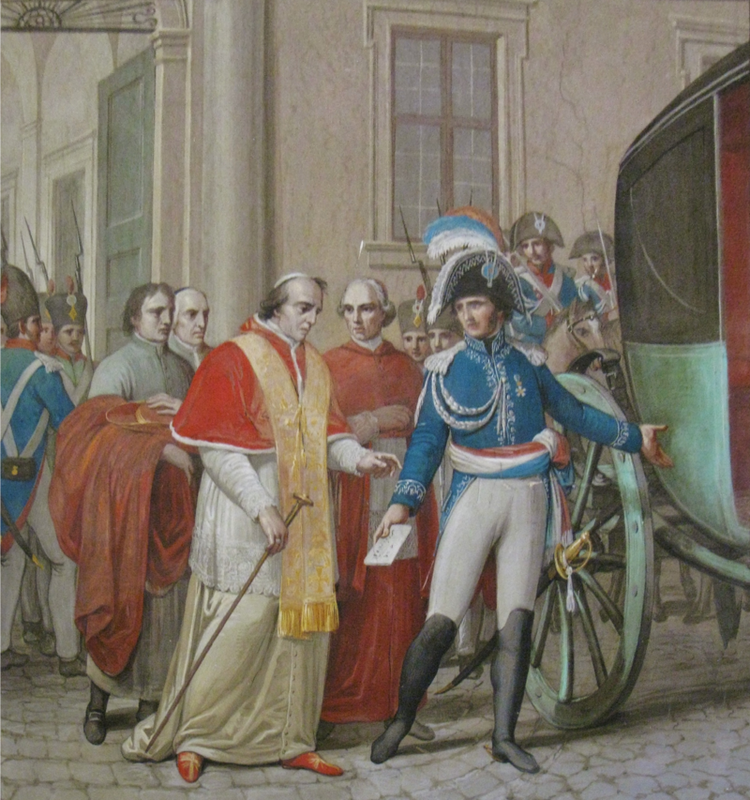 After his election, Pius VII wanted to make peace with Napoleon and negotiated the Concordat of 1801, which established reorganisation of the dioceses and declared Roman Catholicism as France’s chief religion. But it was not long before his relationship with Napoleon deteriorated. Rome was occupied by French troops in 1808 and Napoleon declared the Papal States annexed to France. Pius VII excommunicated the invaders in 1809 but was then taken prisoner by them and remained in exile until 1814. After his release, Pius VII was greatly acclaimed on his journey back to Rome. The Congress of Vienna held between 1814 and 1815 restored nearly all the Papal States, including Rome, to him. Pius VII died in 1823 after fracturing his hip in a fall in the papal apartments. After being briefly interred in the Vatican grottoes, Pope Pius VII was buried inside a tomb in St Peter’s Basilica. In 2007 Pope Benedict XVI granted Pius VII the title, Servant of God. The San Giorgio monastery, where the election of Pius VII took place, was a Benedictine monastery on the island of San Giorgio Maggiore in Venice. It stands next to the Church of San Giorgio Maggiore. The monastery building currently serves as the headquarters of the Cini Foundation, a cultural foundation set up in 1951 in memory of Count Giorgio Cini. 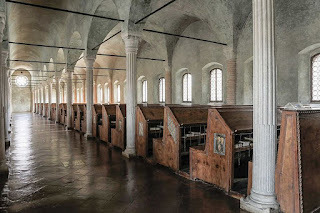 The church itself was designed by Andrea Palladio, and built between 1566 and 1610 in the classical Renaissance style. Its brilliant white marble gleams above the blue water of the lagoon. Cesena, the birthplace of Pope Pius VII, is a city in Emilia-Romagna, south of Ravenna and west of Rimini. One of the main sights in the town is the 15th century Biblioteca Maltestiana, which houses many valuable manuscripts and was the first public library in Europe. It is now a listed UNESCO World Heritage site. The city's castle, the Rocca Malatestiana, was used by Cesare Borgia as a jail for Caterina Sforza. It is octagonal, with two main towers.